A reverse shoulder replacement works better for people with cuff tear arthropathy because it relies on different muscles to move the arm. In a healthy shoulder, the rotator cuff muscles help position and power the arm during range of motion. 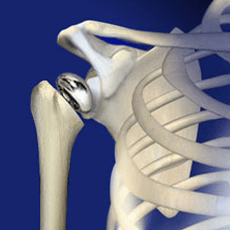 For these patients, conventional total shoulder replacement may result in pain and limited motion, and reverse total shoulder replacement may be an option. **Call the office of Dr. Darren Keiser to set up an appointment & learn if reverse shoulder replacement is right for you.